Warning - what follows is a complete waste of time. Do not spend time reading this blog post. Still here? Of course you are. For the past few days I’ve been addicted to a cool little game called WordBrain. It is a simple idea. You’re presented with a grid of letters and must find two words within it by drawing a ‘path’ from one letter to the next. 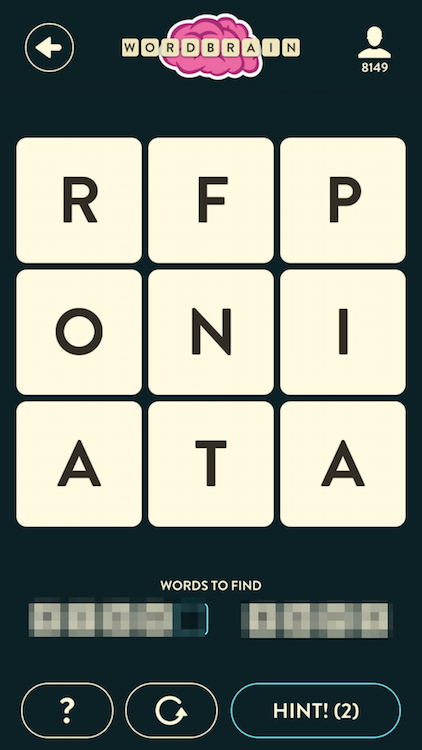 I like word games, but oddly have never really played any on my mobile devices before. Now I know why - they’re incredibly addictive. While playing a few days ago I found myself stuck on one particular puzzle. I’ve obscured the hints in case you want to try to figure it out yourself before reading on. The obscured area though does provide you with a clue. You get the length of each word. In this case, the first word is five letters long and the second one is four letter. One thing you run into very early in the game is that there will almost always be valid words that don’t match. So looking at the puzzle above you’ll see FONT, PINT, PITA, and possibly more words. They are valid, but not what the puzzle wants. As I stared at this puzzle and got more and more frustrated, I naturally thought - I bet I could cheat at this! I’m absolutely pro-cheating in games. Heck, I learned to program because I wanted to cheat. I figured out hex so I could edit my Bard’s Tale characters (and it worked, so hah). Given that we know the length of a word, and we can figure out a ‘path’ through the grid, and assuming we can find an English word list, in theory, it should be possible to figure out all the possible words, right? The EOWL currently contains about 128,985 words. To make EOWL more usable for computer word games there are no words longer than 10 letters, and no proper nouns or words requiring diacritical symbols, hyphens, or apostrophes. Start at the upper left and find the paths from there. We'd have: RF, RN, and RO. We can search the IDB for words that are N characters long that begin with RF, etc. If any match, then find paths from RF. </ul> In theory, using the data above, RF and RN would "die" as possibilities but RO would not. I began to work down this path but had difficulty with the asynch nature. I thought about using promises, but... it just didn't click. To be honest, someone smarter could probably figure it out. I decided to take another approach. For each letter, get all the N length paths possible. 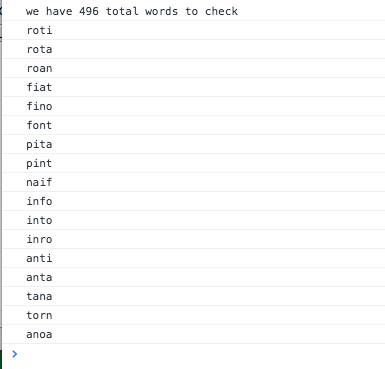 Given a monster list of N length words, check to IDB to see if it is a valid word. Here is my ugly, incredibly ugly, solution. Note I probably have multiple unused variables and bad practices here. Also, I just output to console. Oh, and I also assume a 3x3 grid. I'm pretty sure I could make the 'find paths' portion handle any square sized grid, but for now, I'm keeping it (somewhat) simple. Review: "Build an HTML5 Game"